Well, at the rate I'm going, it might be May before I post about ACTUAL Easter. I have 10 or more posts in Drafts just waiting for me to flesh them out or add pictures to, but so many random things have happened lately that I'm way behind. 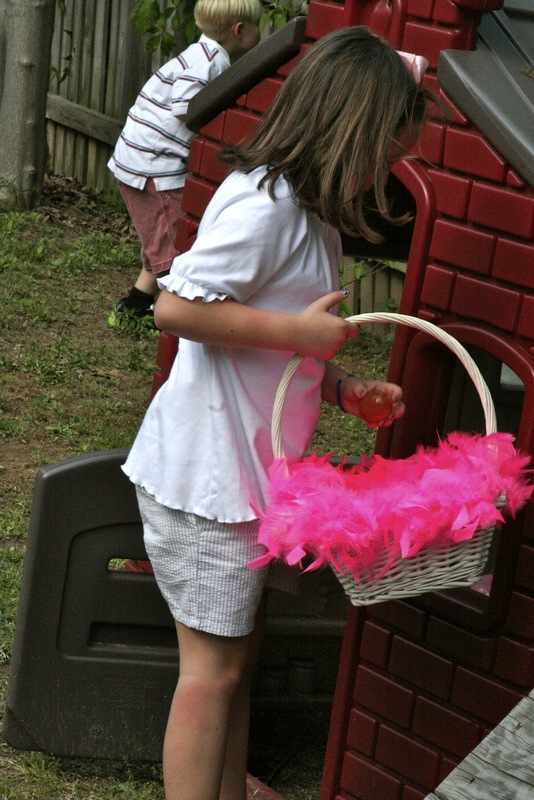 One of the more fun recent events was the annual Easter Egg Hunt at our house for my Bunko group's kids. 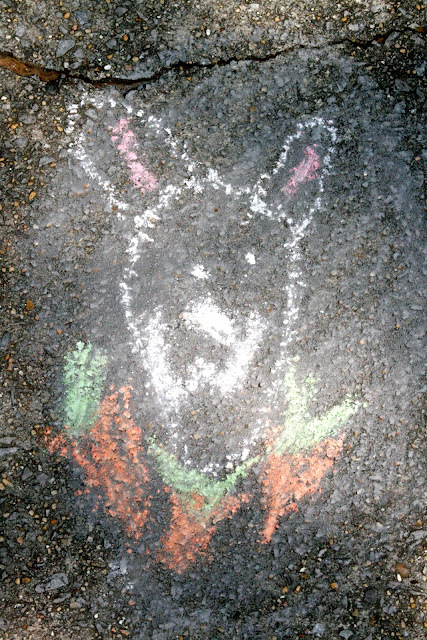 Nick wanted to welcome people starting at the top of the driveway, so he got out his chalk and sketched a bunny rabbit and carrots near the mailbox. He didn't give my friends a whole lot of credit for being able to find their way to the backyard, either. While he drew, he had a little cheering section, and she spurred him on. 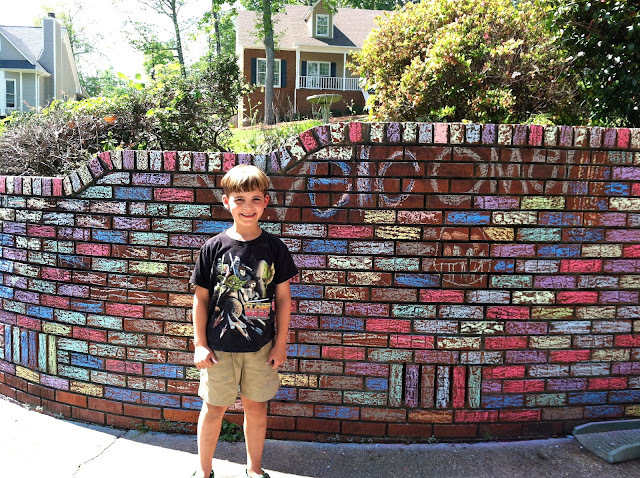 The piece de resistance was the Welcome sign he drew on the retaining wall, which I suggested we color in with our many chalks. He loved the idea. He was so proud of it when we finished! He never tired out ... he rarely does when there's art or other creativity involved. I have to say, the chalking of the wall may become an annual tradition. And Jake was duly impressed. 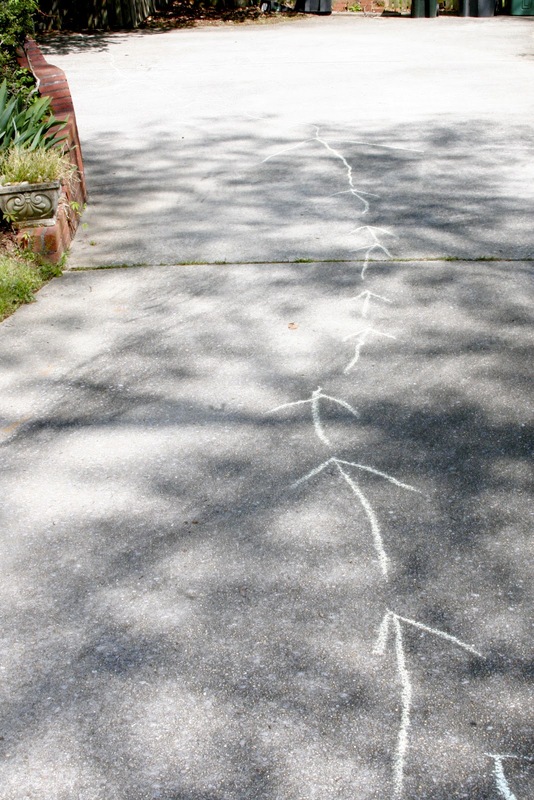 Of course, he wanted to get out a few pieces of chalk and make a contribution, which Nick allowed as long as it was "TO THE SIDE, TO THE SIDE!" The sweaty artiste. Picture taken by the sweaty artiste's mom, who I would like to point out only complained about the heat perhaps 90 times in 30 minutes. Just before the hunt began, I went to pick up our cake from our talented cake lady, Vickie. Once again, she outdid herself. Her attention to detail is always so wonderful, and her cakes are simply delicious. I gave her no direction on the design, as usual, and she cranked out an adorable Easter bunny for us. Funny side note: I have a friend who posted pictures of her daughter's bunny and chick "Easter manicure" the other day on Facebook (Hi, Amy! ), and I commented on the picture, "Adorable! But shouldn't one be a cross and one be a boulder rolling away from a tomb?" And then I commented again, "JESUS JUKE! (For your friends who don't know me, I wouldn't juke you for rabbits and chicks.)" So when I posted pictures of this cake on Facebook later in the day, she commented, "Shouldn't it be the tomb with the stone rolled away?!?" Anyway. 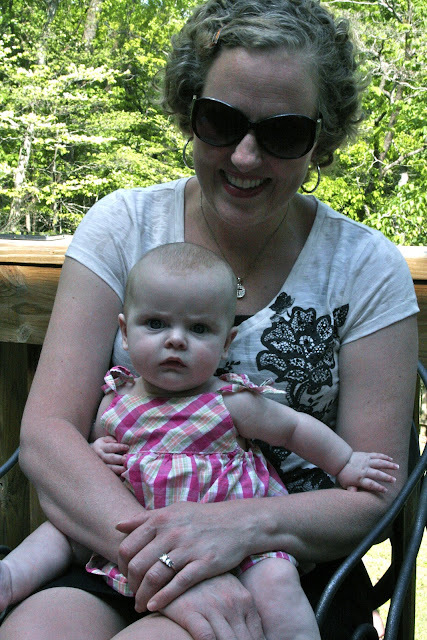 My beautiful friend Cindy, who beat breast cancer last year, came to the hunt with her youngest, Alex, and I snapped a quick picture of her holding a perplexed Amelia Gray. 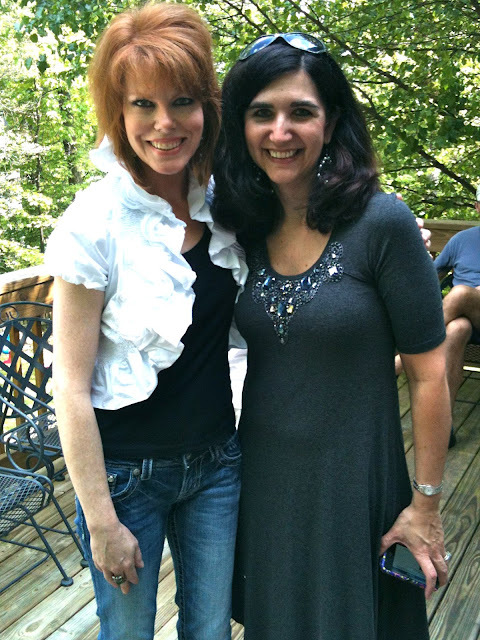 Cindy is one of my heroes! 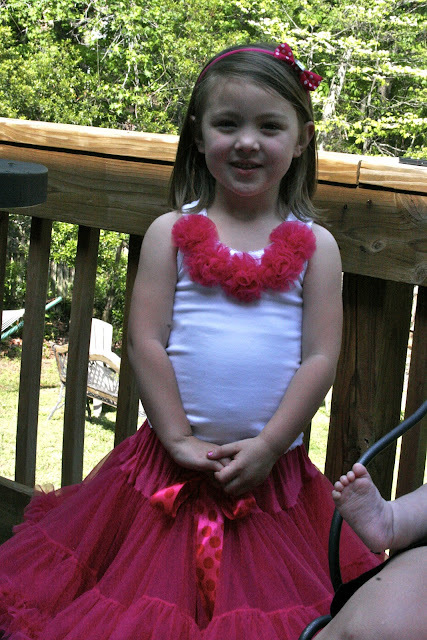 And while I'm on the subject of Cindy, here's her daughter Alex Kate, who was dressed to the NINES, I tell you. So cute. I wonder if Amelia is going to want to dress like that for the Egg Hunt in five years, or if she's going to want to wear one of Jake's old Star Wars shirts. My fashion plate friend Laura, near and dear to my heart, brought her son Brant and daughter Allie. Brant certainly looked the part of the Egg Hunter with his ears on! We finally got all the eggs hidden in the back yard, and I got a picture of the attending kids in front of Nick's masterpiece. These are the youngest of the crew at this point, for the most part ... over the 10 years we've been playing Bunko (or, just as often, getting together and just chatting), the 16 of us have had more than 40 kids. Okay, I couldn't resist. Another one of Alex Kate in front of the wall. 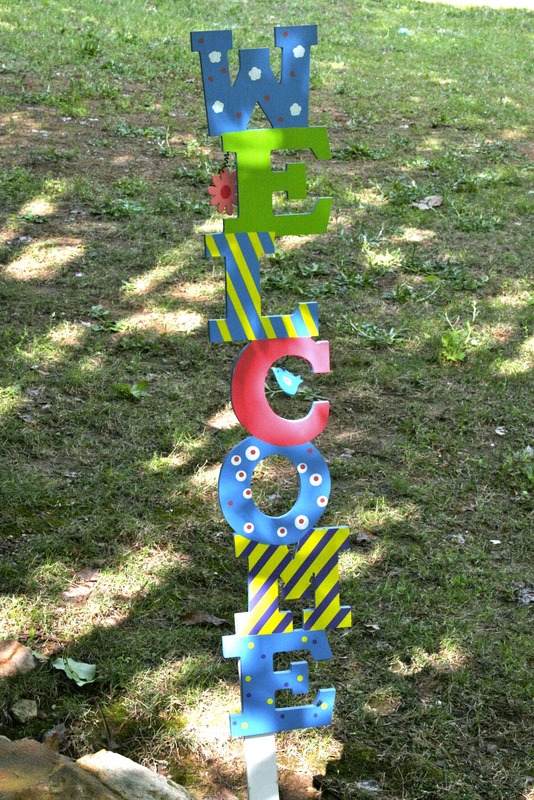 I'm not much for the country yard signs, but several years ago I did buy two of these especially for the Egg Hunt. And if you think it's not hard to get those to go in the ground when you live on top of a mountain where the bedrock is about two inches under the grass, you're smokin' crack. And then they were off! 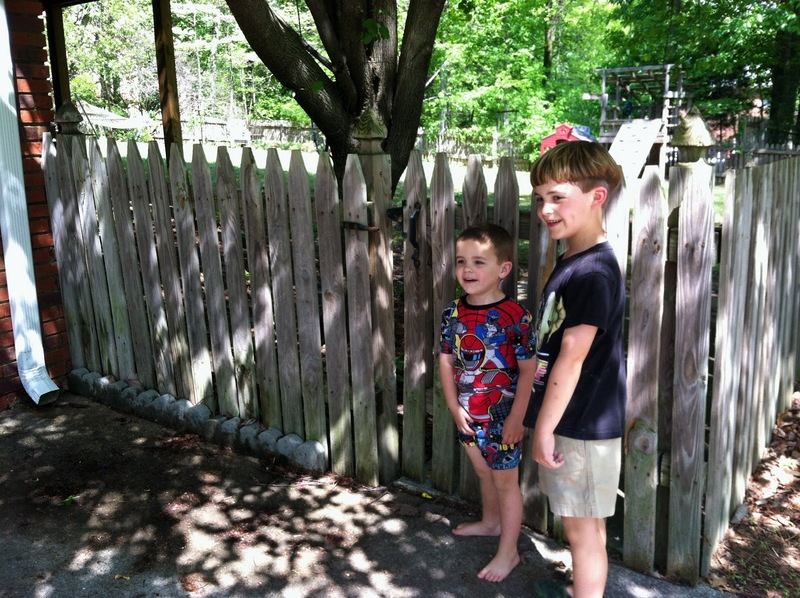 My friend Susie's boys headed straight for the tree fort, where several eggs were waiting for them. 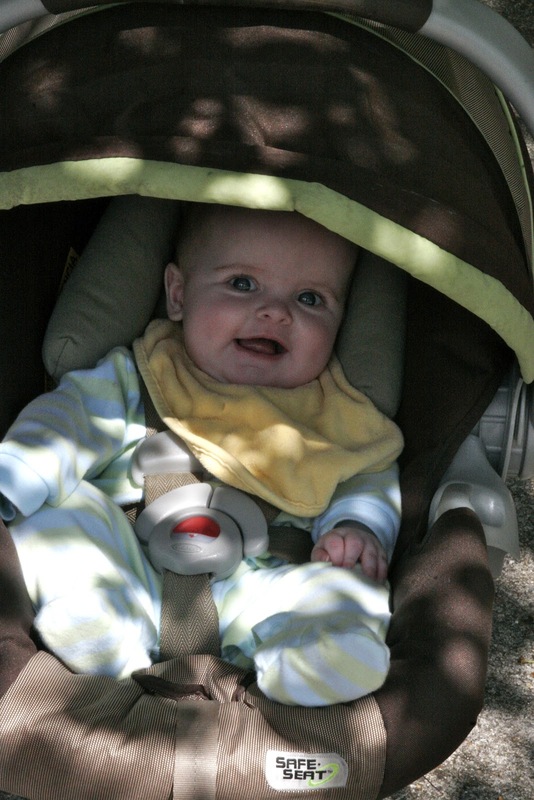 Two of Jamie's kids, Taylor and Parker, headed for the natural area. Jake, being one of the youngest, was let in about two minutes before the big kids, so he grabbed several pretty early on in the game. My friend Holli's daughter Ellison would have won the award for Most Stylish Basket if we'd had one ... I didn't hear the story, but I imagine that's the boa from the Relay for Life event we attended in Cindy's honor last year. It didn't take long, maybe 10 minutes, for the bulk of the eggs to be collected. 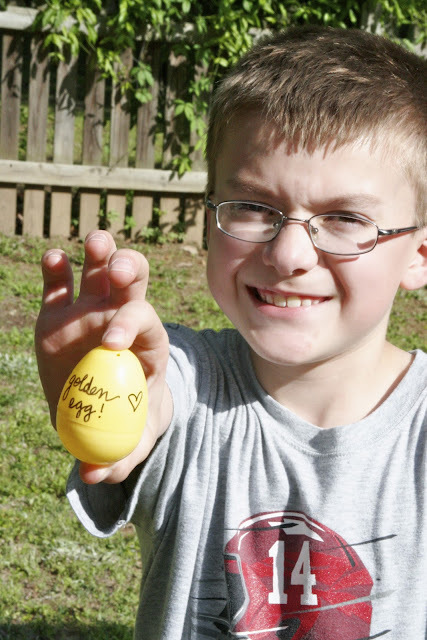 Jamie's son Parker found the Junior Golden Egg, which contained $10. 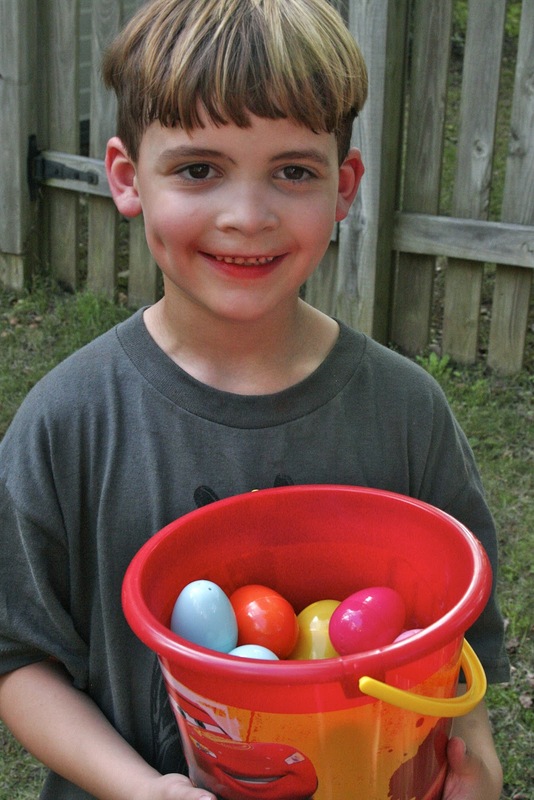 Nick, also known as Mr. Kool-Aid, collected LOTS of eggs. That kid can HUNT. AN. EGG. DOWN. 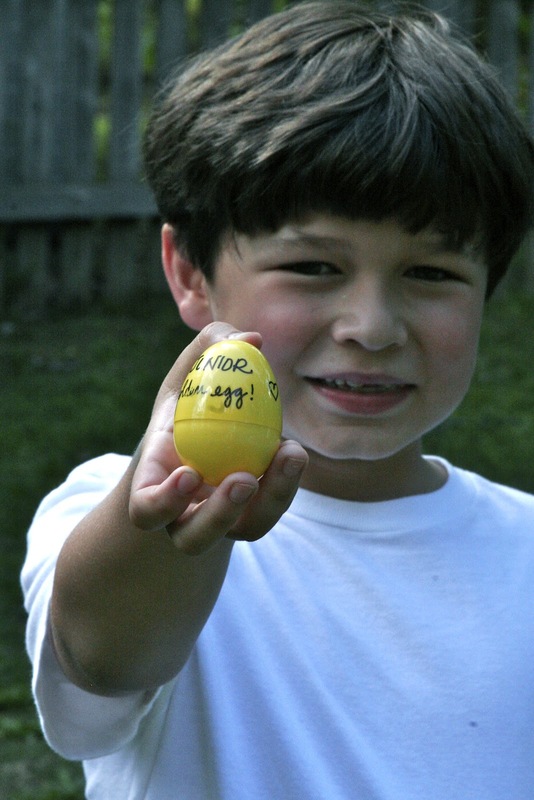 I'm feeling rather cheap with our $1 golden egg! Oh stop it, you look great! What a fun Easter egg hunt! Love coloring on the retaining wall...such a neat idea! And the cake was so cute! Can I join your Bunco group? That looks fun! The retaining wall was awesome. That retaining wall welcome sign is FABULOUS. Just Fabulous. I'm getting caught up on my reading. Sorry you have had such a bad time lately, gulp!! Are things better now? Adorable Easter Egg Hunt. The wall looked GREAT!! Such a neat idea! Seriously, the 16 of you have had over 40 kids...that's amazing! :) And, hilarious comment that you look like you ate Holly, but I was thinking how cute you look! 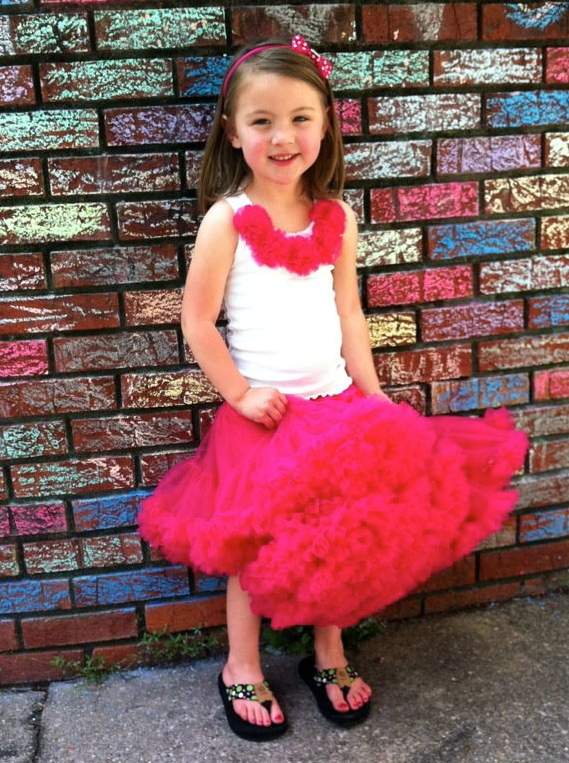 Pink is a great color on you. We see lots of pics of the kids, but sometimes the mommies get left out! Great post!